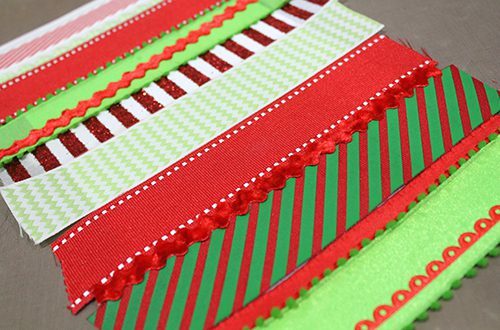 Hello scrappy friends, Tracy here and today I have a fun texture filled ribbon border layout tutorial to share. 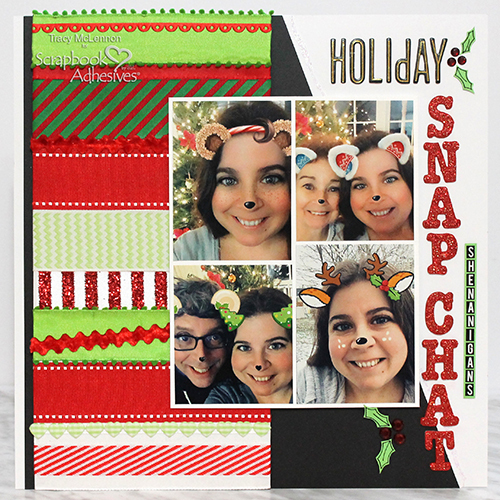 I don’t know about you, but I just love everything about Christmas layouts. 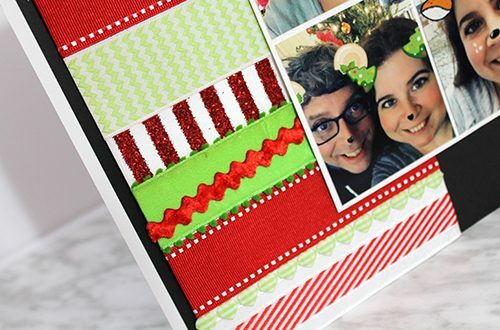 It’s so easy to add a little sparkle, fun colours and like this layout lots of texture with ribbon. Confession: I am a ribbon hoarder. I just can’t get enough. 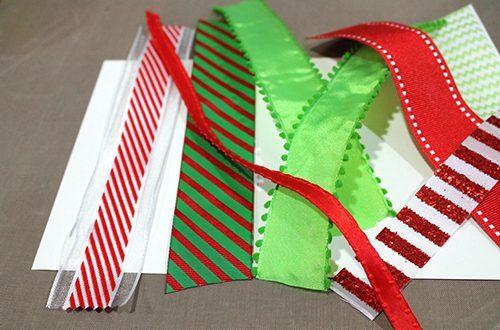 SO this layout digs into my stash of holiday ribbon to create a colourful festive border. 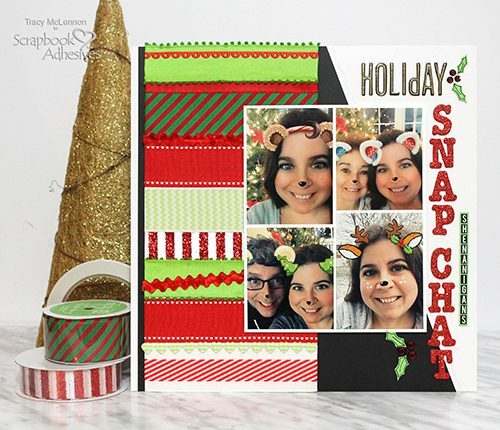 Start by gathering your ribbon, a 6×12 piece of white cardstock, Premium Double-Sided Tape 1/4in and an Adhesive Sheet 6×12 Inch. Cut the ribbon pieces to about 8″ long. 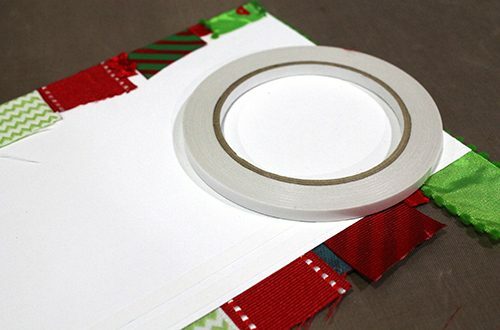 Attach the Adhesive Sheet 6×12 Inch to the white cardstock. 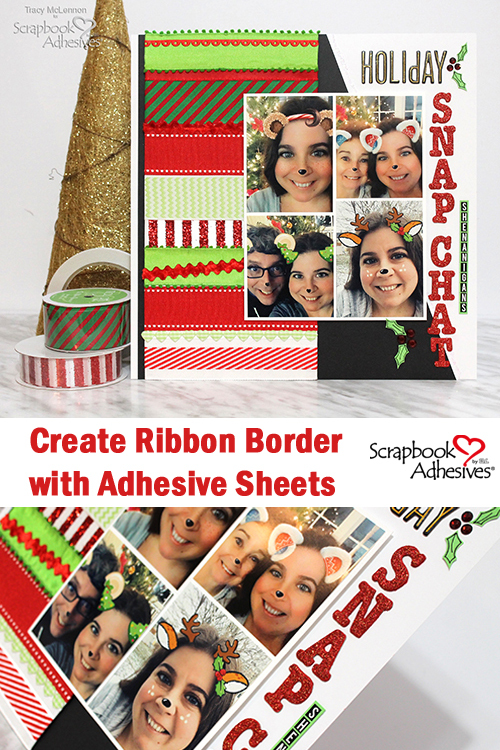 Attach the pieces of ribbon to the 6×12 cardstock, the Adhesive Sheet 6×12 Inch keeps each piece in place nicely. 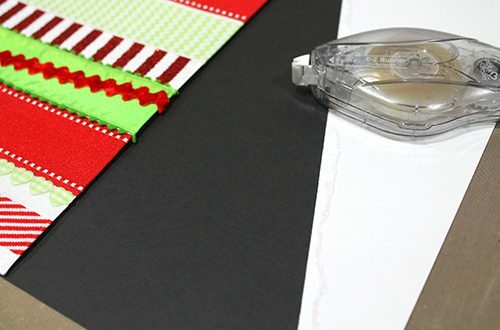 On the back side of the white cardstock, add a strip or two of the Premium Double-Sided Tape 1/4in. 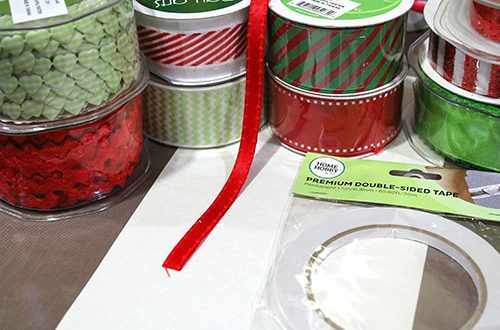 Then fold the ribbon ends around the cardstock attaching them in back. Can you see the start of a ribbon border? 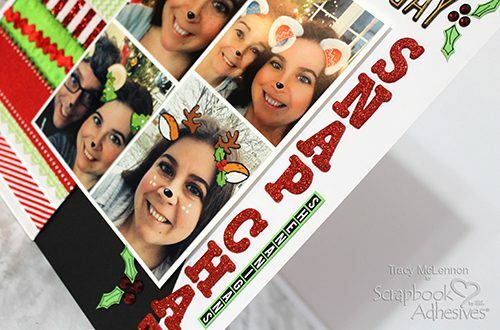 Using the E-Z Runner® Ultra Strong Refillable Dispenser, I adhered the ribbon border to a piece of 12×12 black cardstock, leaving a small border on the left side. Then cut diagonally from the top, down to the bottom right-hand corner. I also added a torn strip of white cardstock along that diagonal edge. Adhere this entire piece to a full sheet of white cardstock. I added Stickles to the torn edge for a little extra sparkle. I matted my 4 mini prints with a single piece of white cardstock and adhered that to the layout using 3D Foam Squares White Regular Size. Next, I added the title using different letter stickers. Then added gems and hand cut holly leaves to accent. This entry was posted in 3D Foam Squares, Adhesive Sheets, Adhesives, Crafts & Tutorials, E-Z Runner® Dispensers, HomeHobby by 3L, Intermediate, Other Adhesives, Permanent Adhesive, Premium Double-Sided Tapes, Scrapbook Page, Scrapbooking, Skill Level, Tutorial, Winter and tagged 3D Foam Squares Mix White, 3D Foam Squares Regular White, Adhesive Sheets 12x12" (25 sheets), Adhesive Sheets 12x12" (5 sheets), Adhesive Sheets 6x12", Christmas, E-Z Runner Ultra Refill, E-Z Runner Ultra Refillable, Holiday, Premium Double-Sided Tape 1/4", Scrapbook Page, Scrapbooking, Tracy McLennon, Tutorial. Bookmark the permalink.